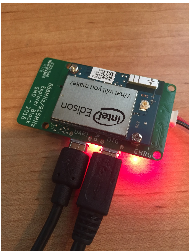 We recommend buying an Edison that is preinstalled with jubilinux. If you did that, head back to the main install instructions to begin installing Wifi and Dependencies. If you didn’t buy your Edison with jubilinux preinstalled, it comes with an operating system, called Yocto, that doesn’t work easily with OpenAPS. The first step is to replace the operating system with a new one. This is called “flashing” the Edison. Both your Windows computer and the Edison board will need some work. Note: Intel has announced the Edison will be discontinued at the end of 2017. As part of this, apparently, the old link to Edison drivers has been removed. We are unsure if this is a temporary issue or long term. 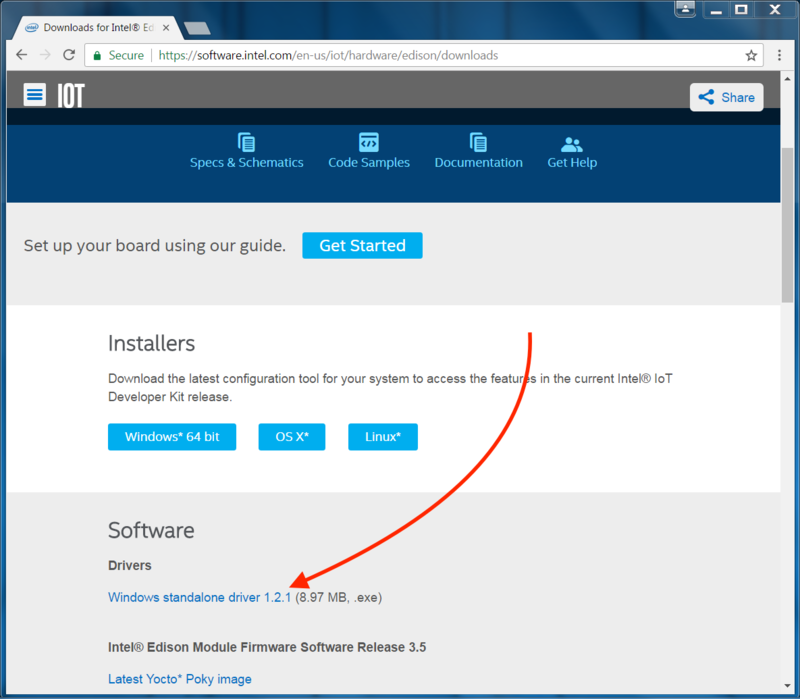 Therefore, if the link above for Intel Edison Drivers is not working, you can use this link to download them directly from an OpenAPS user’s dropbox. 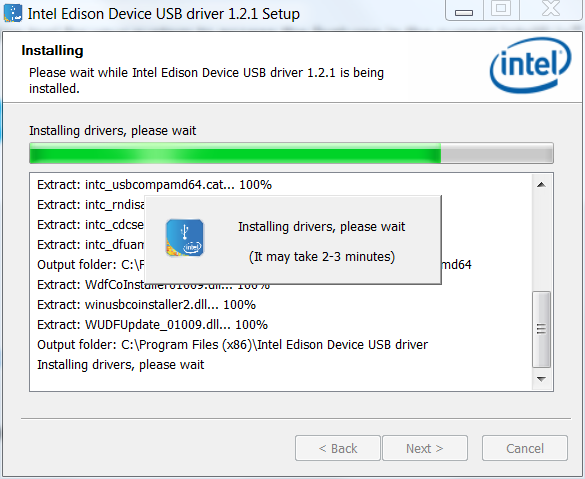 Obviously screenshots below will be different if Intel has not fixed or repaired their driver downloads page for Edisons. 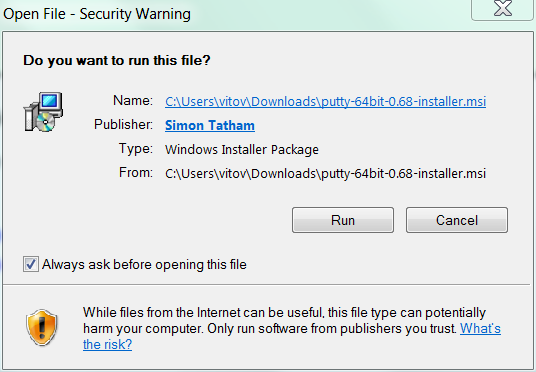 Install PuTTY. 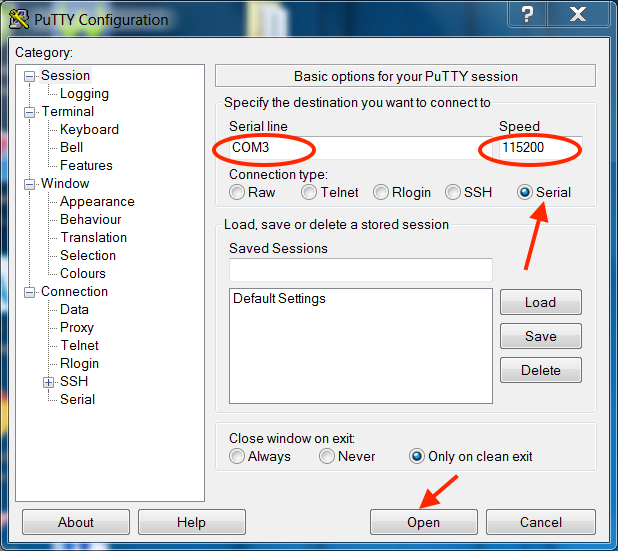 PuTTY is the program you will normally use to login to your rig in the future from the computer. Creating a desktop shortcut for it is a good idea, since you will likely use it often. 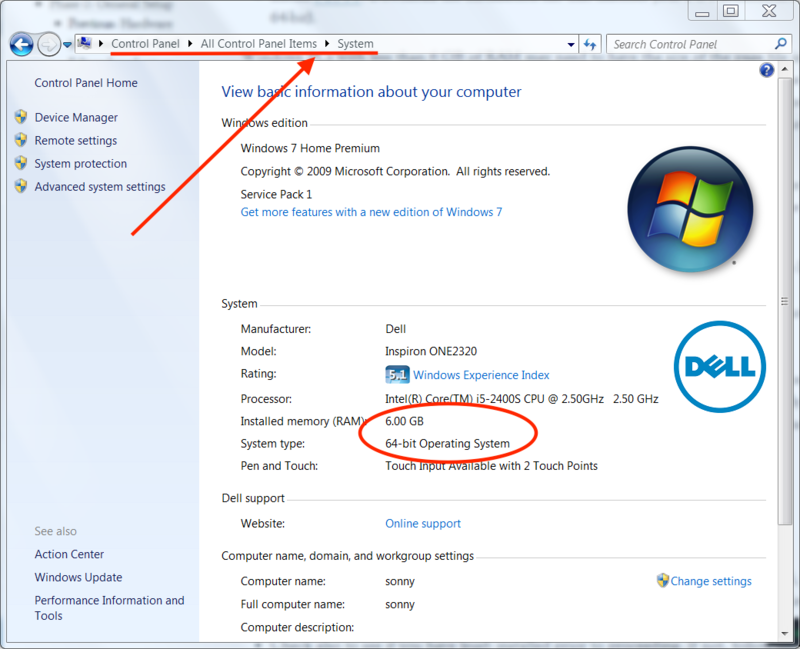 Download the installation file that matches your PC’s architecture (32-bit or 64-bit). If you are unsure, you can check your computer’s build and memory in the Control Panel. Example shown is for a 64-bit computer. 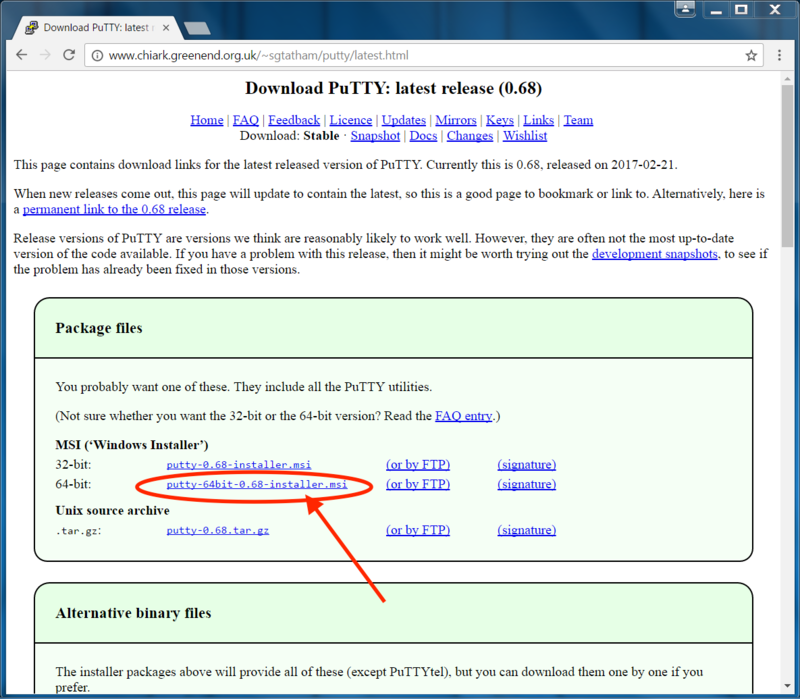 If unsure, installing the 32-bit version won’t harm anything...it just might be a little slower to use PuTTY. 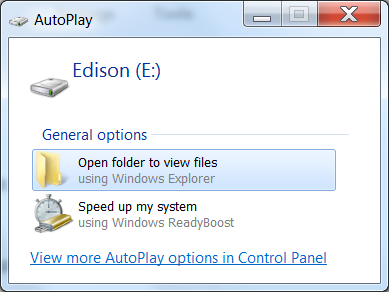 Windows PCs with less than 6 GB of RAM may need to have the size of the page file increased to flash the Edison. 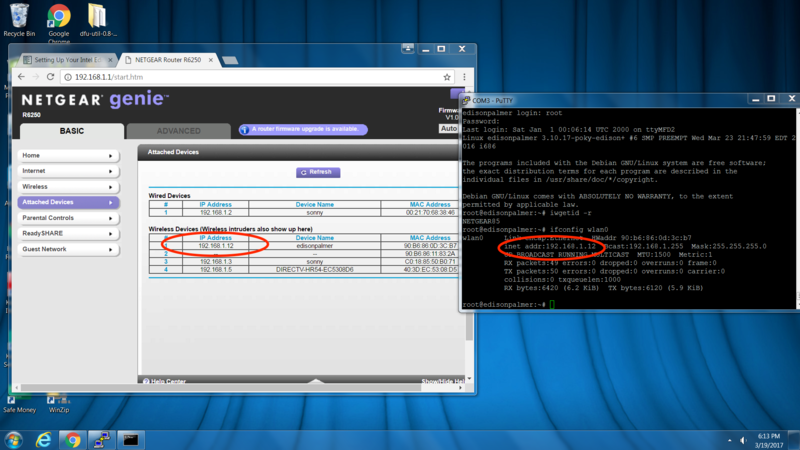 You can check your RAM as shown in the Control Panel picture above. If less than 6 GB is showing, then close all unnecessary programs and attempt to flash the device. If the flash operation fails follow these steps to ensure enough swap space is allocated when the computer boots, then restart and try again. Only do this if flashing the device doesn’t work without changing these settings. Important: Write down the settings in the Virtual Memory window before you make any changes to your system. When you finish the flash process you must return these settings to their original values or Windows may become unstable. Go to the Control Panel, click All Control Panel Items, then click System. At top left click the Remote Settings link. Select the Advanced tab in the System Properties window, then under Performance click Settings. On the Advanced tab click the Change... button to change the page size. Click the Set button, then click OK until all windows are closed. Reboot and attempt the flash process. Note The extract all command comes standard for all Windows machines. However, in some instances, it may not be active for zipped files. If you do not see the extract all option in the right-click menu, right-click the zipped file, choose Properties at the bottom of the context menu. 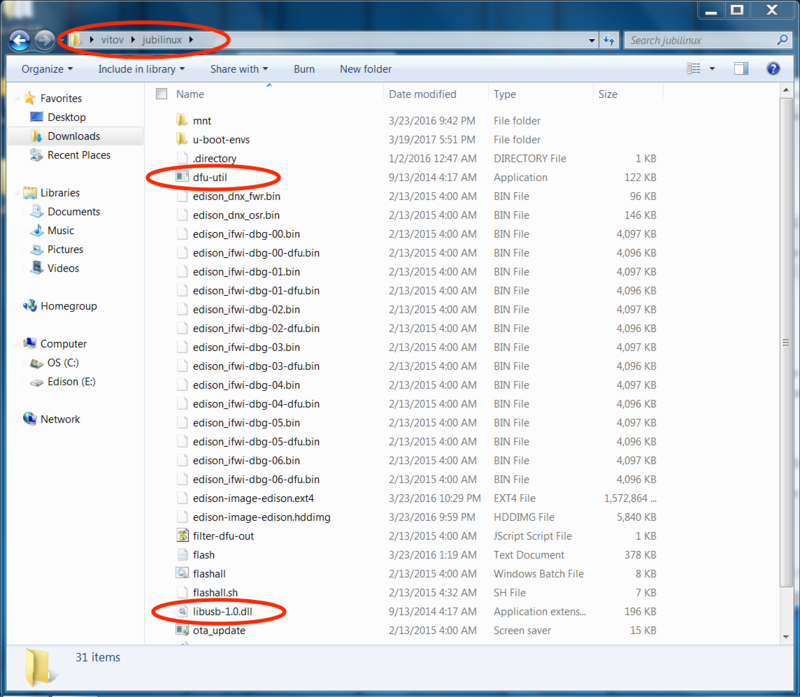 On the General tab, click on the button next to the “opens with” and change it to use Windows Explorer. Apply the change and select OK to save the change. You should now be able to right-click the jubilinux.zip file to extract all. Now we move to the Edison. You’ll see two microB USB ports on your explorer board. One is labeled OTG (that’s for flashing) and one is labeled UART (that’s for logging into the Edison from a computer). We will need to use both to flash. We’re going to plug both of those into our computer’s USB ports using the cables listed in the parts list (Dexcom’s charging cable will work too). Once you plug in the cables, you should see your Edison board pop-up as a connected “device”. If you don’t…try different cables. 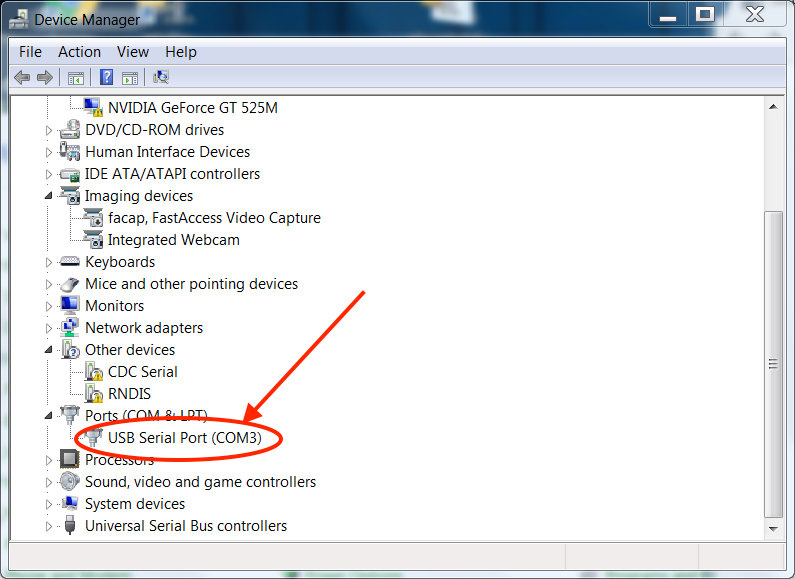 Go to Control Panel\All Control Panel Items\Device Manager\Ports\ and look for USB Serial Port COMXX. If you have multiple and unsure of which is the port you need: Make note of existing ports. Unplug the cable from the Explorer Board. Notice which port disappears. this is the port you are looking for. If only one shows up, that is your Edison’s port. 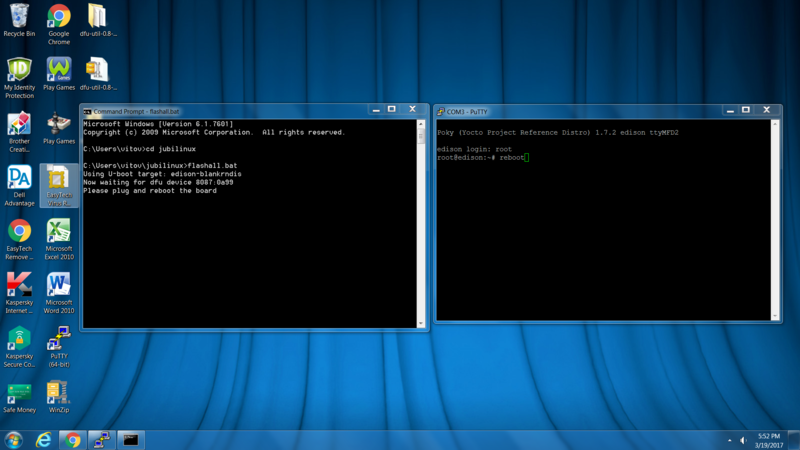 Open PuTTY, change from SSH to Serial. It normally defaults to COM1 and speed of 9600. Change the COM number to the number you found when you plugged into the Explorer Board. Change the speed (baud rate) to 115200. Once you’ve made those changes, Click on OPEN at the bottom of your Putty configuration window. Now you will see a login prompt for the Edison on the console screen. Login using the username “root” (all lowercase) and no password. This will have us ready to enter the commands coming up in the next steps later. Now we are going to open a second window...a “flash” window...using a different program than PuTTY. 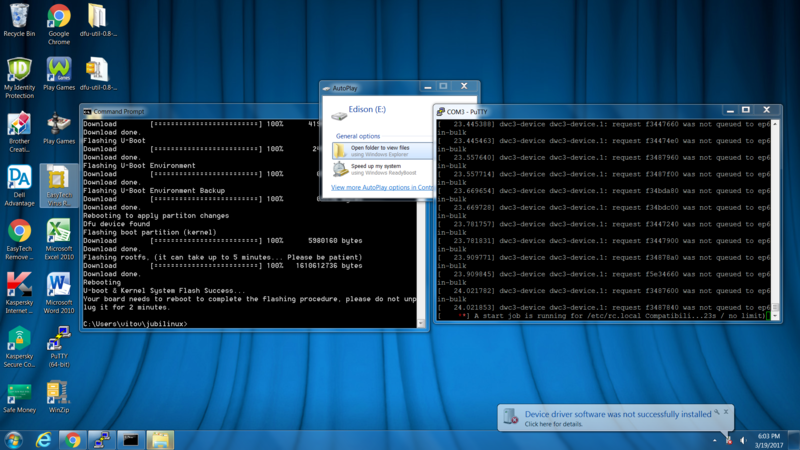 Go to your Windows Start menu and search for a program called Command Prompt. 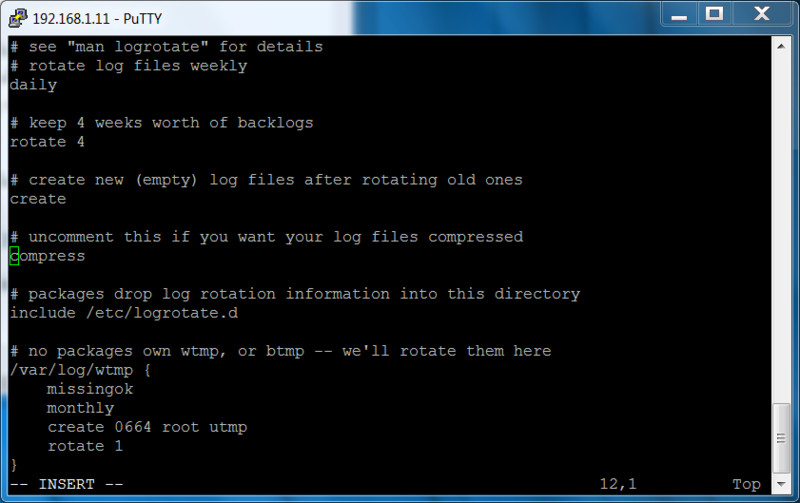 Open Command Prompt and you should be given at a prompt for your User Root directory. Assuming you saved your jubilinux folder to your user root directory (as described above), enter cd jubilinux in the prompt and press return. If you saved it somewhere else, you will need to navigate to that location. Move that flash window to the left side of the screen. You’ll get a prompt that asks you to “plug and reboot” the Edison board. You’re done with this screen for now. Just leave it alone (don’t close window) and go to next step. You will see many, many messages go by on the screens (mostly on the right-side screen). After several reboots (don’t panic), you should get a ubilinux login prompt (If you see Yocto instead of ubilinux, then you need to go back to Step 1-2 and start the flash process over again). Use login root and password edison. From that same screen we just left off , enter these three commands in succession myedisonhostname=<thehostname-you-want> <—But replace the <> section with your chosen hostname.Then run the next two lines, one at a time, without modification. SAVE PASSWORDS somewhere, you’ll want them. Type “i” to enter INSERT mode for editing on the file. HELPFUL TIP: If you are new to insert mode, realize that it inserts characters at the highlighted cursor (it does not overwrite the character showing beneath the cursor). And, the default is that the cursor will be at the top left of the screen to start, so you will need to use the arrow keys to move the cursor to the area where you want to start typing. If you freak out that you’ve made a change that you don’t want to commit...you can simply press the ESC key and then type (no quotes) “:q!” to quit without saving any of your typing/changes. Comment out or delete the wpa-ssid and wpa-psk lines. Type ‘i’ to get into INSERT mode and add the following to the end, once for each network you want to add. Be sure to include the quotes around the network name and password. If you have a hidden wifi network add the line scan_ssid=1. Some wifi networks require you to accept a terms and conditions prior to allowing access. For example, Starbucks coffee shops and many hotels. These networks are termed “captive” networks and connecting your rig to them is currently not an option. Press Esc and then type ‘:wq’ and press Enter to write the file and quit. After rebooting, log back in and type iwgetid -r to make sure you successfully connected to wifi. 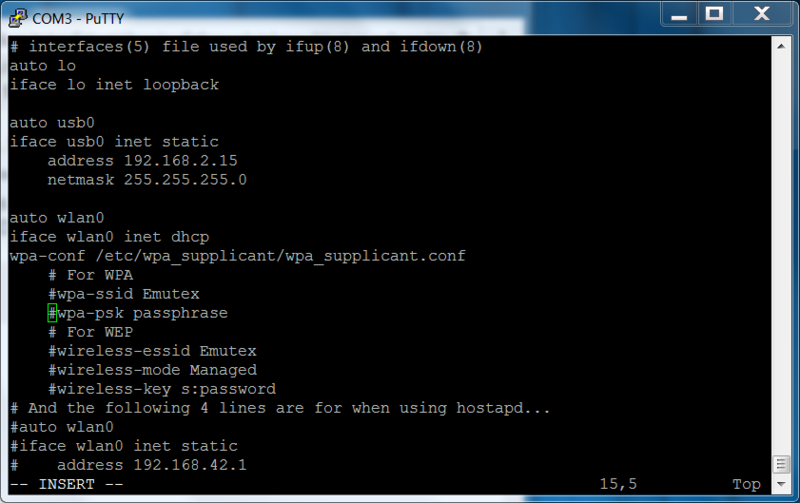 Run ifconfig wlan0 to determine the IP address of the wireless interface, in case you need it to SSH below. Alternatively, if you know how to login to your router, you can also see the Edison’s IP address there. 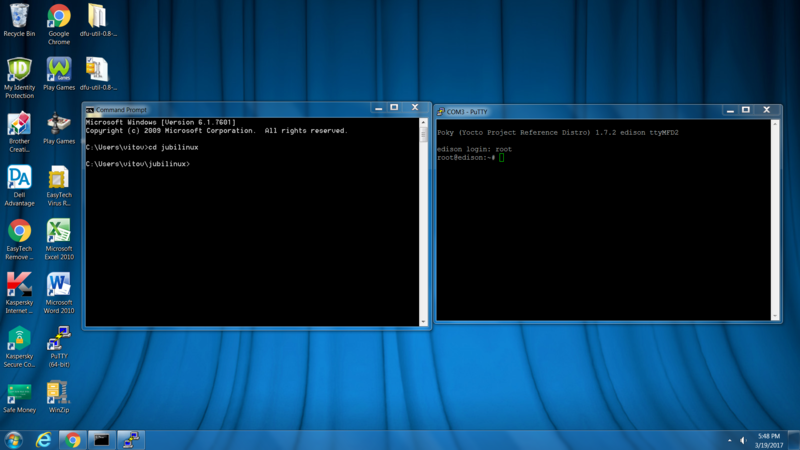 Leave the serial window open in case you can’t get in via SSH and need to fix your wifi config. From a new terminal or PuTTY window, ssh myedisonhostname.local. If you can’t connect via myedisonhostname.local (for example, on a Windows PC without iTunes), you can instead connect directly to the IP address you found with ifconfig above. Login as root (with the password you just set above), and run the following lines one by one. The first line “dpkg -P ... ” will be quick. Check the printout to see that it ran without error. Then run the apt-get lines one at a time. They will take a long while. vi /etc/logrotate.conf and change the log rotation to daily from weekly and enable log compression by removing the hash on the #compress line, to reduce the probability of running out of disk space. You have now installed the operating system and wifi networks on your Edison! You can move onto the next steps in building your OpenAPS rig.